This fall we have had a whirlwind of events since early September. Time is flying by, the leaves are starting to come down in the Hudson Valley, the temperature is dropping and sadly the gardening season is finished. The season began with the opening of Down to Earth: Artists Create Edible Landscapes at the Schuylkill Center for Environmental Education in Philadelphia on September 12th. This exhibition highlights the growing focus and emergence of “green” principles and sustainability in relationship to food, art, design and agriculture. 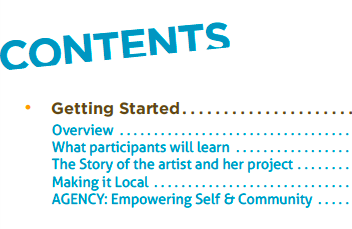 The exhibition includes six artists or artist teams who created socially engaging interventions in the landscape. Their works are related to growing indigenous food, the healing properties of plants, sustainable agriculture, water irrigation, permaculture planting, recycling of materials and deer grazing, all creating an aesthetic and cultural link between art and cultivation of the land. Several current popular books and films about food’s relation to sustainability have helped to propel a new generation of public interest in issues related to organic growing, heirloom seeds, eating and purchasing local food, farmers markets and back yard vegetable gardens. Also being investigated in the media are the negative consequences of monoculture planting and factory farming practices, and the inhumane treatment of livestock in industrial agriculture. The economic downturn and rising fuel and grocery prices have also motivated a new focus on sustainability in relation to food. Many artists have been engaging these important ecological and social issues in the past few years. The Schuylkill Center presented a unique opportunity for artists to interact with the landscape, with its preserved open space and agricultural history. Down to Earth at Brolo Farm, is presented at an abandoned farm site and each of the artists has created a large-scale outdoor work on this four-acre location. Making artworks with living components such as plants and water takes a vastly different approach than creating or placing traditional objects in the landscape. These art projects are dependent on the unpredictability of weather and forces of nature including animals and insects. The implication of potential damage and risks involved in the works surviving have forced the artists to acknowledge that like gardeners, they are merely collaborators with nature. They took on this complex challenge with skill and with the help of many staff members, volunteers, students and friends. After six months of hard work on the projects, constant worry about the weather and water resources being shared, we opened to a day long gathering of at least 200 people. The weather forecast was rain for the entire day – but miraculously the rain held off until just after 6pm when the opening was over. I led a tour group of each project beginning with Joan Bankemper’s Willa, A Medicinal Herb Garden. Joan spoke about the significance of herbs historically, how they were used as medicine by healers and midwives for hundreds of years but were discouraged in the past century due to modern medicine frowning on the practice. She made the timely connection to our present day health care crisis by encouraging visitors to take a preventative approach to wellness by learning about the healing properties of plants and distributed an informational color brochure she had produced for the occasion. Titled Willa after the Paleolithic fertility figure Venus of Willendorf, Joan’s fifty-ft. garden is modeled after this archaic form. Contained inside the figure are seven circles representing Hindu chakras or energy centers from root to crown. Each chakra is planted with herbs and flowers that can respectively lead to healing for that area of the body. (Joan’s printed handout makes the connection of each chakra in the human body – and a list of associated healing plants.) The overall design of this project also reflects on the 1970’s work of Feminist artist Ana Mendieta, well known for her Silueta series of figurative Earthworks which involved carving her imprint directly into mud or sand. Next on the tour was Stacy Levy speaking about her sculptural fence installation Kept Out. This work provides an opportunity to investigate how the deer alter their own edible landscape. The deer's meal choices affect the growth of the forest and the field: their grazing results in fewer seedlings of native tree, shrub and herbaceous species. Due to human influence, deer populations are out of balance and destroying the sustainability of their own food sources in the field and forests. 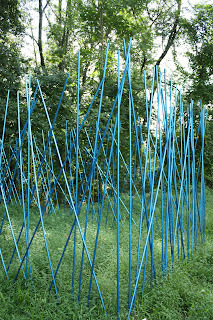 Stacy created two versions of this piece, the first was a prototype on her own woodland site in mid-PA where she worked out the pattern of criss-crossing tall blue metal poles as a deer fence. Stacy spoke about the ways in which deer are ravaging the landscape, eating everything in sight – the end result of which means that far fewer trees ever make it to maturity beyond deer grazing height. This has serious implications and consequences for the future of unprotected woodlands and forests. Since we no longer have large predators for the deer (other than humans in cars and deer hunters in season), they are over-populating. Stacy brought up the fact that we all love to see deer in the landscape and equate seeing them with “nature”, but the irony being that the deer by consuming all their resources will leave nothing left to eat for future deer generations (sound familiar?). The larger unanswered question is what to do about the continuing growth in human population that leaves less and less room for deer and other wild species to roam and eat. Following Stacy was a water leveling demonstration by artist Knox Cummin. His functioning rainwater collection sculpture, titled Not Drain Away provided the water for Ann Rosenthal and Steffi Domike’s American Roots Garden. The three artists decided to collaborate early on in the project, which worked out beneficially for all. Since it rained for a solid month in June, the garden thrived but later in dry, hot August we had to resort to hand watering. Not Drain Away takes the shape of a twenty-ft. square room and is built out of wood attached to the roof of the existing farmhouse. It is complete with rain barrels, piping and an irrigation sys tem. The water collection system is gravity powered and uses no external energy to operate. By collecting rainwater, there is no additional load on the municipal water supply or well water. This elaborate sculpture combines craftsmanship, art and design, proving the case that art can be both functional and aesthetic. Contained inside the structure of Not Drain Away, is a vegetable garden by Ann Rosenthal and Steffi Domike (Pittsburgh, PA). Titled An American Roots Garden, it includes foods common to early America, including Native American crops and those brought by settlers and immigrants. These include corn, squash, and beans (commonly known as the "three sisters"), a variety of potatoes and tomatoes, beets, carrots, sunflowers, marigolds, and herbs. The garden is laid out in a quilt-type pattern that provides a structure to consider the evolution and story of five staple crops and how food cultures are lost or preserved. Ann and Steffi harvested carrots, beets, corn and potatoes the day of the opening. Their garden reached its peak in August both in terms of abundance and beauty. The artists spoke about reconnecting to the past in the use of a “kitchen garden” and stressed the importance of holding on to our individual cultural histories in relationship to passed down food traditions and family recipes. The artists also created a kid’s placemat to hand out at the opening with a word puzzle and kitchen garden quilt for coloring. We then moved the tour out to a large former crop field on the site to speak with artist Susan Leibovitz Steiman. Her garden Urban Defense was a tour de force collaborative project. Susan lives in the S.F. Bay Area, so her project involved local participation from friends, volunteers and student assistants Susan hired from the Philadelphia University Sustainable Design Program, led by Fern Gookin. Susan spoke about creating the garden with techniques of permaculture, a planting method that mimics nature’s principle of combining diverse compatible plantings that conserve labor, water and soil, to produce abundant healthy food. The forty-ft. square installation has at its heart a five-sided permaculture urban forest orchard, contained within a raised bed structure built using locally culled household salvage. The title Urban Defense and the form of the installation refer to Philadelphia’s myriad columned public buildings, and to the political strength of the U.S. Defense Department’s Pentagon. Ecologically, Urban Defense honors another American symbol, the apple—its five seed chambers of diverse seeds can create an entire sustainable food forest. Urban Defense includes more than a dozen varieties of trees, perennial bushes and annuals whose fruits have been shared and donated to local food banks. The last stop on the far side of the same field was to Simon Draper’s Habitat for Artists Collective. The work titled Drawn to / Drawn from the Garden consists of a mini art studio, potting shed, and seven vegetable/flower gardens. The collective of artists in this project included Todd Sargood, Odin Cathcart, Jeff Bailey and Cathy Lebowitz. Draper spoke about his childhood experience of gardening with his father and how that joint activity created a neutral space for otherwise difficult communication. He also related how his interest in shed-making stems from that same period of time, where he saw how the backyard shed could become a place for contemplation, tinkering and creative projects. The HFA Collective has to this date constructed 20 different habitats (sheds) in various sites around the Hudson Valley, NYC and Philadelphia. This project aims to encourage backyard food growing, recycling of materials and the re-purposing of abandoned sites for gardening. Local artists and school groups were invited to collaborate and to adopt two of the garden plots, which provided opportunities for engagement, the shed siding consists of art panels by school children. Down to Earth: Artists Create Edible Landscapes is on view in Philadelphia through November 28th. Read a review of the exhibition in the Philadelphia Inquirer by art critic Edith Newhall here. In order to bring the creativity and huge amount of labor involved in making Down to Earth available to a New York audience, a documentation form of the exhibition opened at ecoartspace in NYC on October 3rd. The same artists from the Philadelphia show are exhibiting photographs, prints and an herbal apothecary by Joan Bankemper. Also included are several additional artists’ projects, a video by Eva Bakkeslett, Alchemy: The Poetics of Bread; a video by Jacinto Astiazaran & Fritz Haeg, The Story of Manahatta and the Lenape Edible Estate Manhattan; a film by Lenore Malen & The New Society for Universal Harmony, I Am The Animal That I Am; Eve Mosher’s mini green roof modules, Seeding the City; Andrea Polli & Chuck Varga’s, Hello Weather! 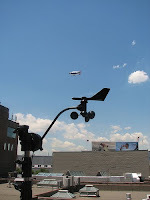 an outdoor data collecting weather station; Andrea Reynosa & Kevin Vertrees, Sky Dog Projects, time lapse videos of corn and hops on their farm with a hops pillow by Donna Sharrett, and Christy Rupp’s food packaging, New Labels for Genetically Engineered Food. The exhibition will remain on view at the ecoartspace NYC office through November 21st at 53 Mercer Street in Soho, NY. Hours are Saturdays 12 – 6pm and by appointment. On Sunday October 4th, performance artist Chere Krakovsky presented her work, Mothers and Daughters at Solar One in the Habitat for Artists shed that has been situated there since July 10th when it left ecoartspace on Mercer Street. Chere’s performance explored how one generation offers its lessons to the next, both learned and unspoken. In the first part of the performance she honored her Eastern European grandmother by washing her laundry by hand the same way her grandmother did a century ago. 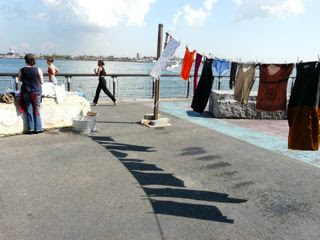 She then hung it out to dry on a clothes line connected to the Habitat/shed with the East River as background. Following this Chere invited her 86 year old mother, Dorothy Krakovsky to join her in the shed to teach Chere to sew by hand, which she in turn was taught to do by Chere’s grandmother. In this piece the everyday and the creative co-exist. The shed served as the home location for the everyday tasks of doing laundry and sewing. Visitors were invited to participate in the sewing lesson or share in conversation about what has been offered/handed down to them from their mothers. The artwork of mother, daughter and grandmother filled the interior of the habitat during the performance. Chere’s performance work revolves around her ever-changing notions of home, it’s location and meaning.